A woman who bombarded the chairman of Crystal Palace football club with lewd text messages and phones calls has been found guilty of harassment. 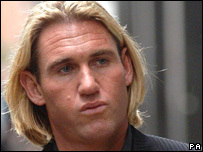 Tara Stout, of Clapham, south London, sent Simon Jordan underwear and love letters after they met in March 2005. The TV sports reporter would call and text him up to 200 times a day, City of Westminster Magistrates' Court heard. The judge said Stout, 35, who denied harassment, was "clearly guilty" and adjourned the case. District Judge Quinton Purdy said the complaints concerned an "avalanche" of voicemails and text messages. He added the correspondence was clearly offensive, some rambling and some plainly inane. He said Stout felt justified in challenging Mr Jordan "bluntly and repeatedly" for what she perceived to be an apparent hypocrisy. Earlier Mr Jordan told the court how she would ring up and read a book down the phone to fill his voicemail box. When asked why he did not just change his mobile number, he answered that he had had it for 15 years and ran his business predominantly from his phone. The millionaire businessman also said she once left him a message threatening to "gut my mother and slice my nieces". Giving her defence on Thursday, Stout admitted sending threatening message but said she did not mean them. She added from the beginning of their short relationship she and Mr Jordan had exchanged very explicit text messages and admitted she loved him. After the guilty verdict, Stout, who had represented herself told the court: "I am not stupid." The former sports reporter said next time she had a grievance against someone she would follow a more "logical process and walk away". She added: "It is all a bit pathetic."